In December 2010, Glasgow Housing Association (GHA) working closely with Strathclyde Police (Police) and Strathclyde Fire and Rescue (SFR) identified that anti social behaviour and tenant vulnerability was having a detrimental effect on GHA tenants and residents across Glasgow. This included those falling victim to vandalism, violence and youth disorder or where individual lifestyles were exposing tenants to serious risk from fire within their home. In an attempt to tackle these issues, GHA, Police and SFR agreed to enter into partnership, seconding a Police Inspector and Station Commander to develop a model which would be effective in improving the lives of residents by reducing the impact of crime and disorder, making them feel safer within their homes and to identify those at risk from fire. Sourcing a bespoke IT system, the CIP designed a new 'customer first' approach, which included the requirement for housing staff to contribute to a 'Patch Picture' by being present within the community, and proactively recording all potential issues identified through their own observations or highlighted to them through speaking to tenants and other members of the public. 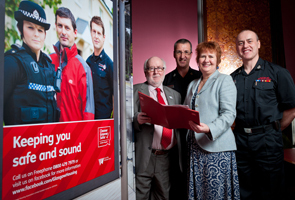 Furthermore, the CIP created an automated process, to allow GHA and Police Staff who identified those people at risk from fire, to make a referral to SFR to enable a visit to their home to provide safety advice and install alarms through a Home Fire Safety Visit. To ensure all problems are discussed and resolved, an operational tasking meeting was set up in every housing office, chaired by Housing Managers, and attended, where appropriate, by local Police and SFR personnel, allowing the joint tasking of resources to address emerging issues. This allows effective intervention to be made at the earliest opportunity. Following the successful review of the initiative, formal agreements have been signed between GHA, Strathclyde Police and SFR resulting in staff from all three organisations co-locating to purpose built state of the art premises. Accidental dwelling fires decreased by 18.7% with secondary fires (often directly attributed to anti social behaviour) decreasing by 40.7%. Both returns are compared to baseline figures recorded 2008/2009.